Equally at home in the urban jungle or the outdoor playground, the Axis 18 Rucksack is ready for commute or canyon. The die-cut EVA foam shoulder harness and spacer mesh backpanel both support and ventilate. The removable webbing waist belt will keep your load close and under control. The outside of the backpack has three zipped pockets, the top one incorporating a useful key clip. 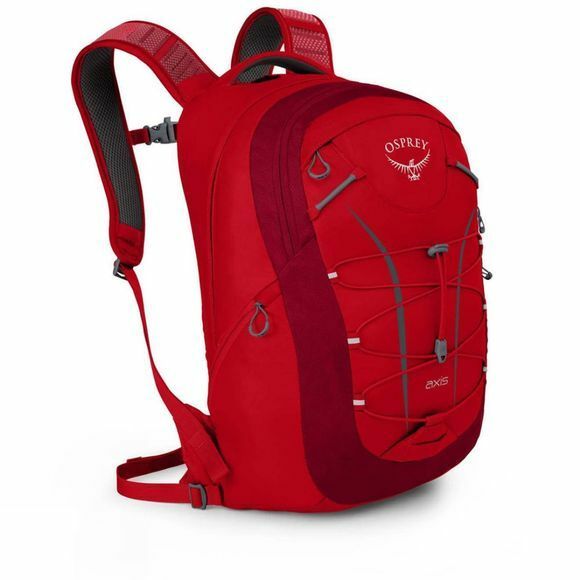 Osprey have also included a bungee compression system, the perfect place to store a jacket or bike helmet. If you're looking for a laptop bag then look no further. Inside you'll find a padded laptop sleeve for the city, which can double as a hydration sleeve on the trail. Jetting off on holiday? Rest assured that the pack size conforms to maximum EU carry-on dimensions, so is ideal to use as hand luggage.